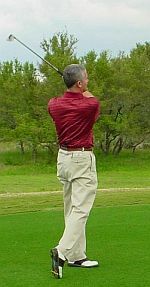 "…As a PGA Professional I myself use the HeartFlex to strengthen hands, arms, and chest for golfing activities. Along with these benefits I get vital cardiovascular exercise. All in all I find the HeartFlex to be a winner…"
"The HeartFlex Upper Body exercise tool is an excellent warm up tool for golfers. It creates a continuous, light resistance throughout a range of motion. The tool takes your upper body through a number of exercises and motion, which are necessary for a smooth golf swing." "…the HeartFlex a perfect way to warm up for golf…The neat thing is that the HeartFlex can be used standing, sitting, walking, or lying down, working out on a treadmill or stair climber, or even watching TV…I give the HeartFlex high marks for versatility…"
"The HeartFlex device is portable and easy to use, and would make a smart addition to any golfer's pre-play warm-up and overall conditioning routine." Injuries to the wrists, forearms, and elbows account for a significant percentage of golf-related injuries. Most golfers don't realize that the golf swing places significant stress on the body that can result in nagging injuries. Furthermore, most recreational golfers fail to appreciate the importance of a proper stretching and warm-up routine before playing a round of golf or hitting a bucket of balls at the range." "The HeartFlex upper body exerciser is, without reservation, the best fitness product to reverse…golf injury." "Take it to the office, hotel, or anywhere you want a great workout. Need to warm up before your next round of golf? HeartFlex will do the job."